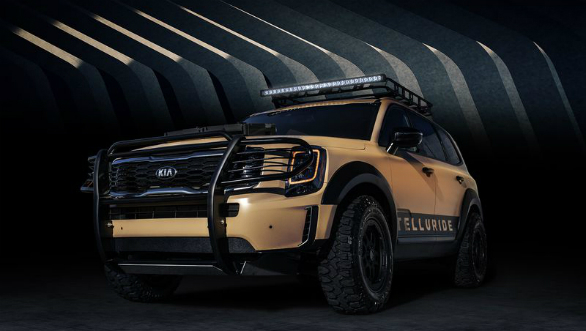 Kia Motors has shown its upcoming Kia Telluride SUV at the ongoing SEMA show in USA. Following the New York fashion show car, the Tellurides being shown are not stock. 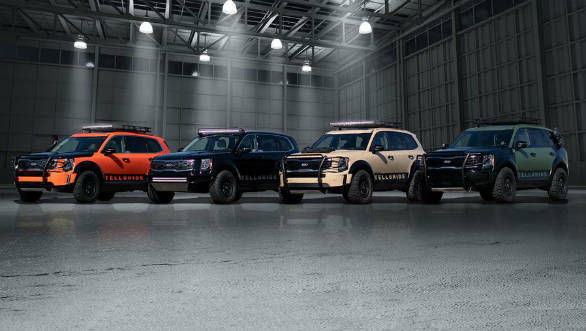 Four concepts have been shown, all of them fitted with aftermarket mods which express a different design theme and highlight the SUV's off-roading potential. The stock Telluride gets a boxy design theme throughout with smooth curves softening the look. 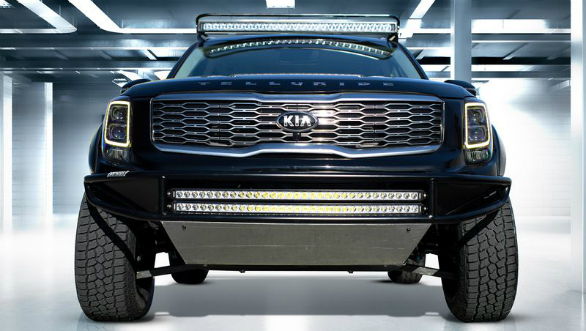 The front is dominated by the massive chrome Kia family grille with the tall headlamps adding to its distinctly American styling influence. The sides are relatively featureless and don't do much to hide the visual bulk of the SUV. The rear stands out with the unique, inverted L-shaped LED tail lamps, giving it a distinct look. The first of these is the Telluride Horizon Roamer. This concept gets a black and orange paint job. 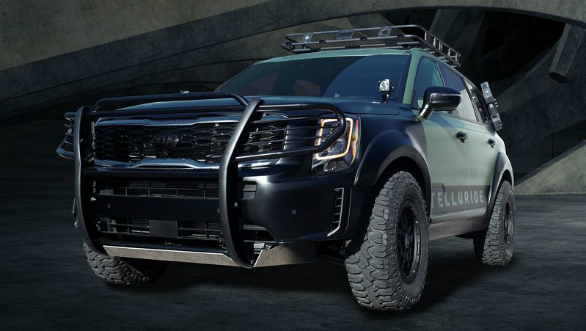 Additions include a bull-bar, a luggage-rack with an LED light strip, a custom brush guard and skid plate, a straight pipe exhaust and a snorkel. The SUV also rides on uprated 32-inch off-roading tyres. The second concept shown is the Telluride Cadet Leader. This carries a more military-inspired look with its army green paint job but the modifications on it are largely similar to the Roamer. This one loses the snorkel, gets a spotlight on the bonnet and adds a jerrycan on the rear quarter panel. Next in line is the Telluride Desert Drifter. This one is more focussed on dune bashing, unlike the trial conquering intent of the earlier two cars. This gets hood-mounted rotopacks. The last one, Telluride Baja Glider, takes inspiration from the Baja-style of off-roading and is meant to cover long distances quickly in difficult terrain. This loses most of the heavy exterior additions of the other cars, but gets a curved LED light bar, and a smaller bumper for better approach/departure angles. The interior is also the most opulent of any Kia model, apart from the K900 sedan from which it draws obvious influences. There are no details available yet on powertrain option but the Stinger GT's 3.3-litre twin-turbo V6 with 365PS and 510Nm seems like an obvious choice. A hybrid version and a V8 version powered by the Genesis G90's 5.0-litre 420PS motor could also be made available. Four-wheel drive and an eight-speed automatic should also be available. 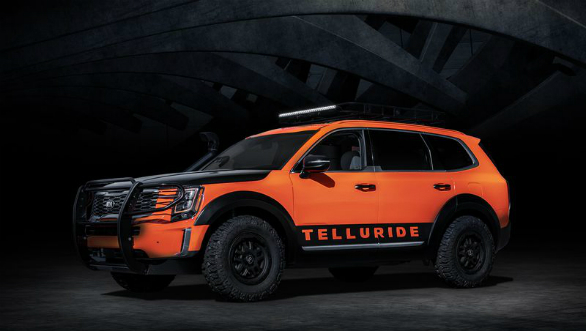 The Telluride will be of ladder-frame construction and compete with full-size SUVs in the US like the Ford Expedition and Chevrolet Suburban. This is a big segment in the US car industry dominated mostly by American and Japanese manufacturers. The Kia Telluride is highly unlikely to make it to India, where the company is focussing on cars like the SP concept to give it a strong footing.